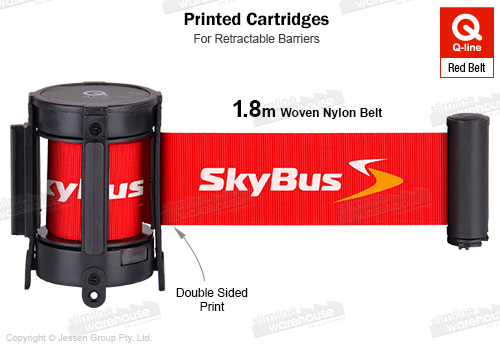 Queue belts have custom designs digitally printed in 2 colours onto red woven nylon belt! The queue belts have custom digital printing that allow 2 colours to use in your design to advertise at retail stores, cinemas, shopping centres, car dealerships, exhibition halls, and many types of events. The crowd control barrier is 1.8m long and has a 4-way adapter that makes it easy to create a queue or section off an area by attaching to stanchions or wall mounted clips. The retractable post systems, queue belts are replacements that are easy to change out in minutes using only simple tools. The tamper-proof clip on the end of the crowd control belt helps keep it in place whilst in use in public areas. Dual-sided printing creates an effective marketing display that maximises exposure to visitors without taking up additional space on your floor. Check out our online catalogue to see hundreds of products in a huge variety of categories that can be used to outfit your business without breaking the budget. With over 20 years in the business, Slimline Warehouse has become a national leader in POP, POS, retail, & exhibition displays. Orders paid by 1pm EST will despatch same day to anywhere in Australia, including Brisbane, Adelaide, Perth, Sydney, Canberra, Melbourne, Darwin, & Hobart.